Most colts are born with their testicles descended, but that's not true of every one. The age at which the testicles drop varies from colt to colt; certain breeds' tend to drop earlier than others'. The testicles of thoroughbreds and quarter horses should descend by the age of 18 months, according to the American Association of Equine Practitioners website. Other breeds might have later "drop-by" dates. Generally, while the colt is still in utero, the testicles move from inside his abdominal cavity through the inguinal canal, from which they descend into the scrotal sac. If the colt's testicles aren't descended at birth, they often descend within two weeks. 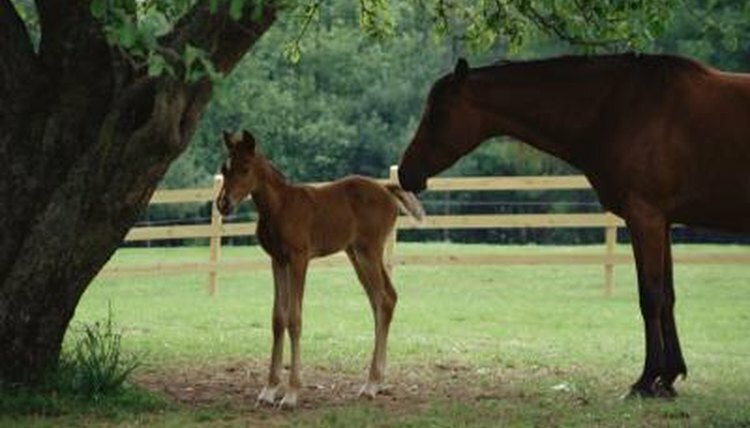 If your foal's testicles haven't dropped when he's still a baby, don't panic. There's still plenty of time for them to appear that falls within a normal range. It's possible that a colt’s testicles, apparent at birth, will seem to disappear several weeks or months later, as he grows. That's because as his body grows rapidly, the testicles don't grow much; you might not be able to palpate the testicles in his scrotum. They didn't retreat into the abdomen, but they might be too high in the groin for palpation. At this age, they aren't producing sperm and are relatively small. As the colt reaches the age of sexual maturity, between 18 and 24 months, they grow considerably and become quite apparent. If one or neither testicle has dropped by the age of 2, the horse is considered a cryptorchid. In cryptorchid horses, one or both testicles are retained. The missing testicles are either in the horse's abdominal cavity or his inguinal canal. While a horse with only one descended testicle can still breed, it's not a good idea, as cryptorchidism is often hereditary, according to the "Merck Veterinary Manual." That retained testicle also makes the horse at risk for testicular cancer. A horse with only one descended testicle is known as a ridgling. While gelding a horse with both testicles descended is a fairly straightforward procedure, that's not the case with a cryptorchid. The majority of male horses are castrated before reaching their second birthday. This operation leaves a horse without the libido and related behaviors of a stallion and prevents certain physical changes in the male horse, including less thickening of the neck and an overall less muscular appearance. Depending on your vet's preference, castration takes place with the horse either standing or recumbent, with appropriate anesthetic. Most horses recover very well from the surgery, although a danger of complications always exists. Excessive bleeding or signs of infection should prompt an immediate call to the vet. Surgery on a cryptorchid usually requires an equine hospital. Today, the retained testicle can be removed via laparoscopy, a much easier procedure than the abdominal surgery previously required.